Your best option is to work from the bottom back up or from the top down... and by doing so you have to work with half sized composition which in return can be rotated and nudged back in to place by making overlaps.. or simply take a close look at the outlines so far and rebuild the bottleneck from scratch in order to avoid having to nudge and rotate anyway! Not bad work so far by the way... nice and clean! 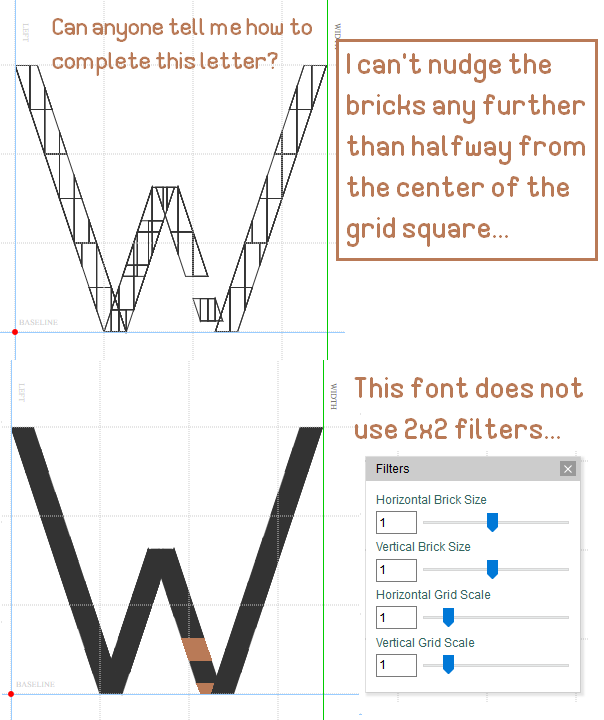 Another tip for any future attempts on hairline fonts is, When the stroke weight is smaller than 1/2 grid square unit its desireable to put filters @ 2x2, it will be slightly more difficult to keep track of every brick in complex situations, but you get a lot more movability in return. It can be done in 1x1 as well, but in a 1x1 situation I advise to work with pure geometry to simply make 1:1 composites for each grid square seporatly, and repeat this process for the entire glyph..
this way you avoid running into any issues at all. The only downside with this last option (although probably the best) is that this is going to ruin the font sample that will be provided by fontstruct. 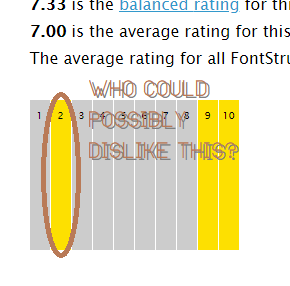 This is one major disadvantage of Fontstruct's sample generator when it has to deal with composite bricks. Somebody has it in for you, I would say. I would change it up a bit, things like use the right left top of the bottom lobe of the 6 on the 5 and vice versa, but that is merely a style choice and it's still a 10/10 because it's supposed to be your vision, not mine, is well constructed, very unique and quite simply, someone is trying to get under your skin and piss you off, bloody frustrate you. I'd like to say don't worry about it, but that is the issue, people do things out of spite. And unfortunately, it does ruin it for everyone because competition is healthy, period. To knock someone out of an opinion based rating system is underhanded and unfair, not just to you, but to all of us that want to reach a level of expertise, and to those browsing and just checking out innovations, to not be presented with it when searching the top ratings. I even made a statement font for this nonsense! its called "DOWN VOTE"
Right and left contradict themselves... I wonder what you mean by "...right left top of the bottom lobe..."
The "lobe" of a character being the loopy part. The right top left of the 6 being the only actual lobe/loop, but differentiated as the bottom lope/loop because one might think of the top lope/loop as an unconnected lobe/loop, like that of the connected lobe/loop of the 8. That is, if we think of the 8 as two loops/lobes, then I am refering to the bottom part of the same loopy/lobe area of the 6 & 5, when using the 8 as the model for reference. I don'y know how to explain it. The bottom half, if divided into quadrants, I am refering to the top right quadrant of the lower half. The curve of the 6 (in the upper right quadrant of the lower half - the loop) is more accute, tighter. I would put that curve on the 5 and vice versa, though I think you would wind-up with a shorter top terminating top loop. Idk how to say it.